Find your perfect doula. With over 9,000 doula profiles, you can review education, certification, fees and special services offered. Read reviews from other families who used the doula you are considering. DoulaMatch availability searches help eliminate the first question most families ask when hiring a doula "Are you available for my due date?" Certification and training matter. Doulas have the opportunity to display their certifications on DoulaMatch for your verification. With over 10,000 doulas, you’ll find the right doula for you. An extensive profile allows each doula to list her experience, education, certification and special services offered. Over 30,000 testimonials from real families provide insight into what you can expect from each doula. 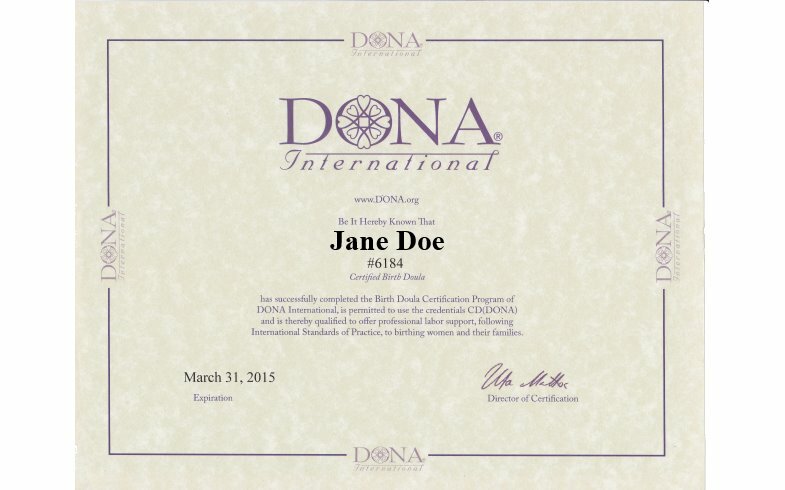 Online doula certification images help you verify a doula’s qualifications. 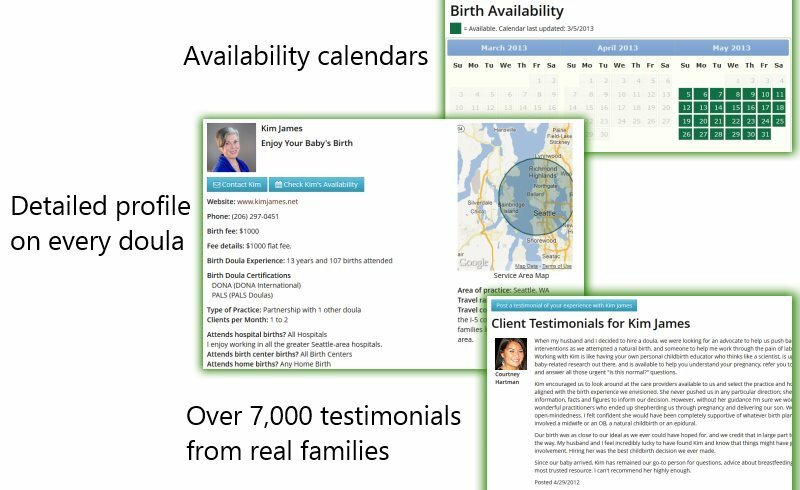 Instantly verify if a doula can serve your due date through her availability calendar. Skip the phone-tag question of "Are you available for my due date?" "Heidi suggested many different positions, supported us throughout my labor, did her wonderful back rubbing, worked WITH our midwife, helped my husband through the tough parts, and at the end, was there as my husband “caught” our daughter. We truly feel that without Heidi, we would not have had a successful VBAC- she has been, and will continue to be a blessing in our lives!" "I cannot say enough good about Elizabeth. Makes this old grandmother want to do birth all over again with a doula, especially Elizabeth! She has all the tricks to the trade to make birthing go so quickly and smoothly. She keeps things so calm and mother so relaxed. In my book, she is THE BEST DOULA out there. I would love to fly her anywhere to be my daughters doula again. It was a tremendous experience from start to finish." "My wife and I found the perfect doula (thanks to this website) which allowed us to experience a very pleasant birthing experience." "I am a physician very comfortable with medical interventions. I am also a mom who wanted to attempt an unmedicated VBAC in the safest way possible. I'm grateful to Stacy, her expertise as a doula, her excellent massage skills, and her calming presence. She gently guided my mental preparation for natural childbirth. She interacted with the hospital staff with the utmost professionalism. This birth experience was dramatically more positive and more rewarding than my first birth." "She was my rock, helping me understand what was happening, what the medical concerns were and confirming that the hospital team wasn't kidding when they said my labor was not normal. She helped buy me time to think, helped me process my thoughts into coherent questions for the medical team. She never spoke for me or decided for me, but helped me advocate for myself." "Nikki's doula services were a gift from my sister and brother-in-law. She was the best gift I've ever received. When I ended up with an unplanned epidural prior to my unplanned c-section, she held my hand and let me cry through the pain. Nikki helped me get through the grief that I experienced at the loss of my ideal birth. Her knowledge and experience was a Godsend and I will forever be grateful for her presence in my life."